Hello, hello! Isn’t this year flying by - it's almost August!? And you already guessed it but we are here with a new feature post from the wonderful Bookworm Candles and Crafts. If you’ve been following our previous posts then you already know lots about Bookworm Candles and Crafts and if not, don’t worry – you can click this link HERE and have a quick look at what this company is all about. Today we are going to show you something really special. And I mean really special. And it’s going to be about one very special series that I know you all love. It’s one we love as well and even though the series has finished, we’re all still talking about it and begging companies like Bookworm Candles and Crafts to make more bookish goodies about this series. So…… today’s post will centre round THE LUNAR CHRONICLES by Marissa Meyer! Bookworm Candles and Craft have recently released a new range called fairytales and fables twist range. This is based on all those great fairy tales retellings out there and of course the first series to be created is inspired by the Lunar Chronicles by Marissa Meyer. So if you haven’t already seen them around on Twitter or Instagram or from her reps, well now is your chance. This is the first candle to be created and of course it’s inspired by Cinder. This candle is called Cinder's Fight smells like dry tears, courage and true heir. It’s perfect for you floral scented fans as this has a gorgeous floral scent. The second candle from the range is Scarlet’s Love which is inspired by the second book in the Lunar Chronicles series. Scarlet’s Love smells like alpha, unconditional and tomatoes and is perfect for you fruity scented fans as this has a lovely fruity scent. The third candle from the range is Cress’ Freedom which is inspired by the third book in the Lunar Chronicles series. Cress’s Freedom smells like hacking, dreams and butterflies wings and has a really fresh true floral scent. The fourth candle from the range is Winter’s Innocence which is inspired by the forth book in the Lunar Chronicles series. Winter’s Innocence smells like sweetness, candies and beauty and it also has fruity, caramel scent with hints of cinnamon. And lastly, no Lunar Chronicles set would be complete without the evil Queen herself Levana which is inspired by the novella from the Lunar Chronicles series, Fairest. Levana’s Vanity smells like glamour's, cruelty and ambition and has a fruity, floral scent with hints of bitter sweet lime. Now all these amazing candles come in four great sizes 2oz mini starter candle, 4oz best seller candle, 6.5oz jar and lastly 10.5oz large jar and with all the usual bookworm candle touches and the prices also range from £3 - £10.50. There is one last thing we’d like to share with you and that is the Lunar Chronicles series has been picked for August’s monthly bookish box called Stars Above. It's an amazing tribute to your personal favourites. This themed box is going to have 4 candles in the box as well as other goodies and the good thing about this box is they are all exclusive items that you can’t purchase in store already! Available for £16.50 and it will ship around 15th August so get your orders in quick! The Review: You all know that YA fantasy has fast become my favourite genre and I’m always on the lookout for new series to try, so when I read Ruined by Amy Tintera last year I was instantly sold. 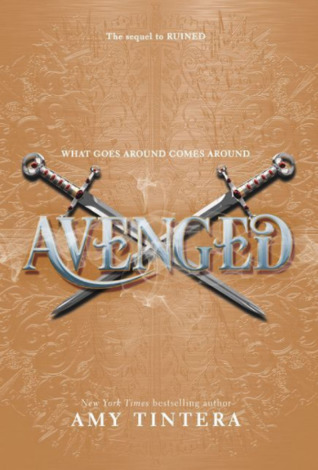 With the release of Avenged - the sequel to Ruined, this series is now becoming a favourite because I enjoyed Ruined a lot but I enjoyed Avenged even more. Emelina Flores has done the impossible. She has infiltrated her enemy’s world to rescue her sister from capture. Now finally free, Em and Olivia gather up the remaining Ruina people and try to rebuild their lives. However, with Olivia hell bent on revenge and with the Lera forces breathing down their necks, Em and Olivia aren’t safe yet. And so Em turns to the one person she never thought she could count on – Casimir, the Lera Prince for help while also trying to battle her feelings for him. While a war is brewing from all sides, Em must decide the right choice for her people while trying to stay true to herself in the process. I absolutely loved this book! I was actually quite surprised because you know sequels tend to have that problem of being boring or suffering from middle book syndrome but not Avenged. Avenged was action packed from the start with the story becoming stronger and stronger with each page and the story was very unpredictable. It really was hard to work out what was going to happen next. It also has great chemistry between the characters and the romance - just enough to keep you on your toes! I really enjoyed reading Emelina and Cas’s point of views in the first book but one of the main reasons I enjoyed Avenged more was because we also saw more from Aren and Olivia. As a reader it was great getting to know them more – okay, maybe not so much of Olivia as I really don’t like her but, it was still interesting to read more about her. I honestly cannot wait to read the next instalment when it releases. I already know how I’d like the series to end but I honestly don’t know if that will or can happen. Either way, I’m eager to find out!